The name Tim Maia may not ring much of a bell today, but in his time, it was legendary. Born in Rio de Janeiro in 1942, Tim was part of the culturally omnivorous generation that produced many of Brazil's most famous musicians, including artists such as Gilberto Gil, Caetano Velosa, and Os Mutantes (the latter of whom gave Tim crucial support during his early days). After starting a band called The Sputnikis (with a group of ex-gang members) in his teens, Tim moved to the United States, where he got a first class education in American popular music. Jailed and then forcibly deported after being caught smoking marijuana in a stolen car, he began his career in earnest during the early seventies, racking up major Brazilian hits with his first two albums. And from there? Things got seriously weird- cults of logical positivity, flying saucers, more drug intake, and song after song featuring his enormous booming voice. Sadly, Tim, who would have turned seventy on September 28th, passed away in 1998 at the age of 56. The Luaka Bop label, which had long been a fan of his work, fought for almost a decade to get the rights to release his music. 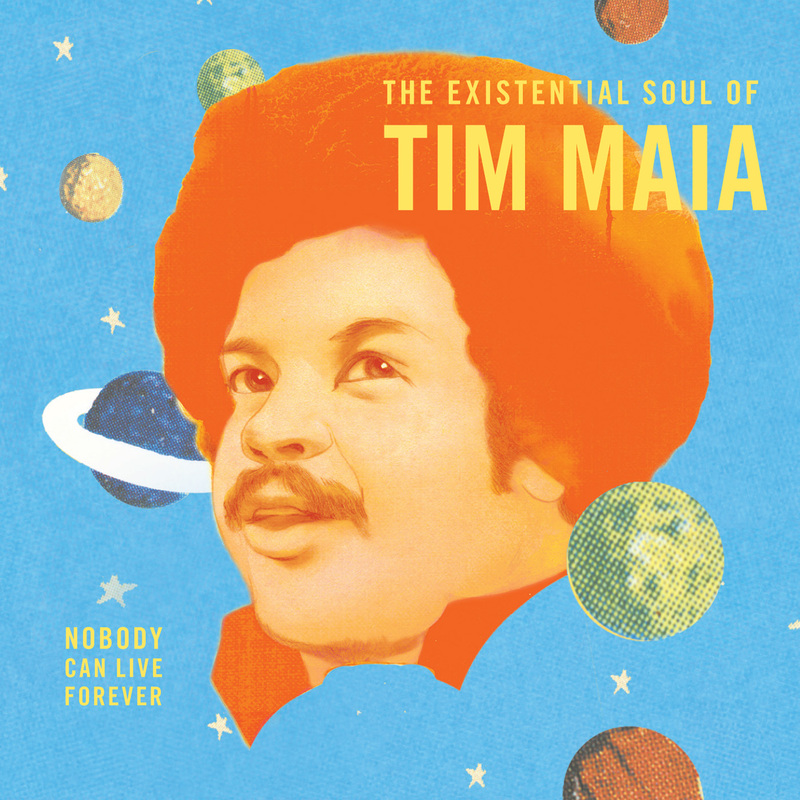 This year, just in time for what would have been Maia's 70th birthday, they succeeded, and Nobody Lives Forever: The Existential Soul of Tim Maia is the result, becoming the fourth volume in the label's series of world psychedelic classics. While the music on Nobody Lives Forever is certainly psychedelic, its potency lies more in the myriad trippy details of its smooth melodicism rather then in the broad strokes of an echo-swathed freakout. Even in comparison to the sweet flavors of tropicalia, Maia's vibe packs a surprisingly velvety punch. That said, it also remains (as the album title points out) a type of soul music, albeit one of a rather peculiar variety. Avoiding the gospel-derived intensity that underlies so much American soul, Maia's restrained funk and bright arrangements more closely recall the pop-soul of the mid-sixties, with tracks like Lets Have a Ball Tonight bringing to mind the early work of Sly and the Family Stone or- at its funkiest- Curtis Mayfield, both of whom threw together horns, fuzz-guitar, and a backbeat into similarly stylish arrangements. Yet these comparisons don't do justice to Maia's enormous voice, the power and character of which utterly dominate the proceedings. On tracks like Nobody Can Live Forever, he moves effortlessly from a mystical soul-brother rap to a full-bodied belt, delivering the chorus with a force and confidence that recalls mid-period Elvis at his best. And Elvis might really be the best descriptive touchstone here- not because of any specific musical similarity between the two men, but because of the sense of grandeur that adheres to the singer in both cases. Tim Maia had a voice like a ship- majestic, self-assured, and inarguable there, a singular presence. Existential soul? It sounds something like radical subjectivity, the self expanded to the size of the universe. Of course, this kind of egotism comes with its drawbacks- Maia lived to excess, and he died young, having been dogged for years by health problems. Some of his music (readily available from youtube) suffers from a similar sense of bloat. But the carefully selected tracks of this compilation ably showcase the positive- a man unconstrained, blasting his message of peace and love out into the endless cosmos.